Facebook today announced the Antivirus Marketplace and welcomed Microsoft, McAfee, TrendMicro, Sophos, and Symantec to the Facebook Security family. Starting today, we will be incorporating the combined intelligence of Microsoft, McAfee, TrendMicro, Sophos, and Symantec to Facebook’s existing database of malicious URLs, and offering a wide selection of anti-virus software to our users. This program will help us provide even better protections to those using Facebook, no matter where they are on the web. Facebook users who are logged in, will be able to download free antivirus software from the Antivirus Marketplace. Users will be able to download six-month licenses to full versions of anti-virus software at no charge from Microsoft, McAfee, TrendMicro, Sophos, or Symantec. Moreover, Facebook’s URL blacklist system, which scans trillions of clicks per day, will now incorporate the malicious URL databases from these security companies too, and augment Facebook’s existing level of protection. These companies will now henceforth, also provide important material to the Facebook Security Blog to help those who use Facebook, keep their data and information about themself secure and safe. 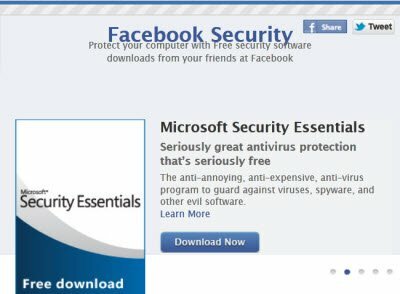 The Facebook Antivirus Marketplace will be available to both Windows as well as Mac users. Why Mac ? It doesn’t need it, right ? Don’t Bother the links Don’t work then it tells you that you’ve already downloaded an Anti virus download and you ain’t getting another Save yourself a lot of time and Hassel and Download Microsoft Security Essentials, and feel safe in two ticks….